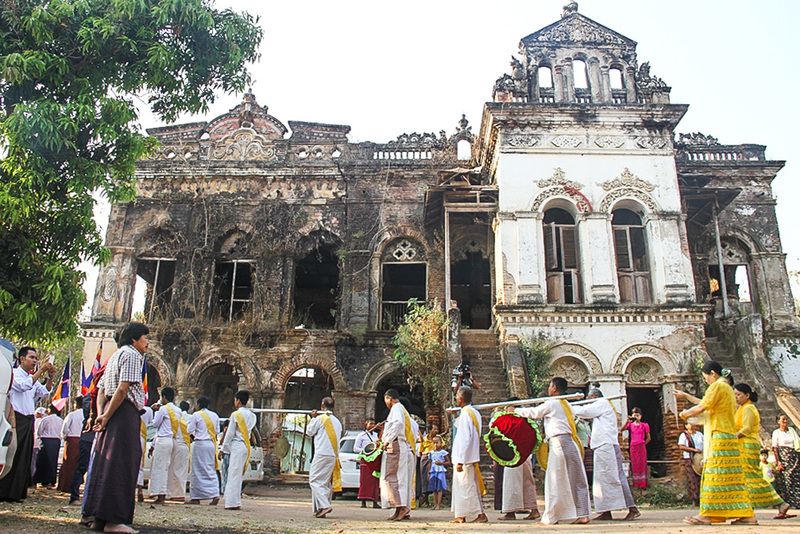 YANGON—Amid the furor over Bagan’s precarious application for UNESCO World Heritage listing this year, it shouldn’t be forgotten that Myanmar already has one World Heritage site. Sri Ksetra (often pronounced Thayekhittaya), along with the ancient cities of Beikthano and Halin, were the locations of Myanmar’s mighty Pyu kingdom and were given a coveted place on UNESCO’s list in 2014. The Pyu kingdom flourished between 200 BC and AD 900. Today, most travelers to the city of Pyay in Bago Region come to visit the impressive Pyu sites of Sri Ksetra. Whether you hire a motorcycle or tuk-tuk or have your own car it takes about half a day to visit all the sites. Note that Sri Ksetra is too spread out for walking or cycling from site to site. After leaving the urban hub of Pyay city you will approach the outer boundary of Sri Ksetra at the Nagatunt City Gate which was once one of nine gates protecting the ancient city. Today all that remains are the ruins of red brick walls though a large, white UNESCO World Heritage stone marker here is a reminder that this is the entrance to a historically significant place. Next stop is the museum (5,000 kyats for foreigners; closed on public holidays). 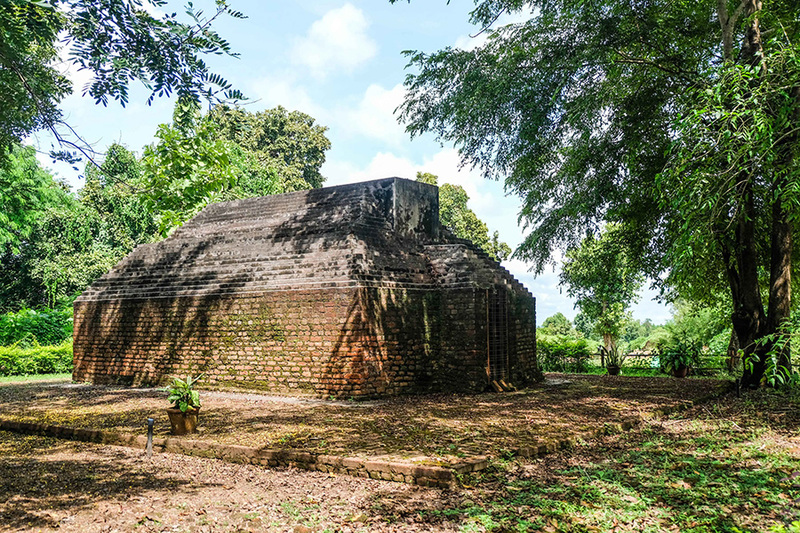 It holds some of the more valuable and significant archeological findings from Sri Ksetra and gives background information for what you are about to see. For foreigners, this is where your driver will take you to pay the 5,000 kyats Sri Ksetra zone fee. At the palace citadel you will see the remains of a once thick and powerful wall built during the Pyu period to protect the most important kingdom residents. Excavations here found iron objects, terracotta roof tiles, hairpins made with precious stones and inscribed bricks. Today, only the wall ruins remain and you may find a herd of goats playfully scampering around them. Following this, Yahandar Pond, which looks like a fairly insignificant lake surrounded by trees and with Bawbawgyi Pagoda in the background, is said to be where Buddhist monks bathed after attaining enlightenment. It is also a sign of the sophisticated hydraulic network of the ancient kingdom which supplied water from a nearby hill range to the surrounding area year-round. Nearby, Rahanda Temple is gated shut but original stone carvings of Buddha can be seen through the gates. Passing more farms of rice paddies, sweetcorn plantations and farmers tending trellises of beans, you will come to one of the most famous and giant structures from the Pyu era: Bawbawgyi Stupa. The huge, solid cylindrical stupa measures almost 47 meters in height and the lack of detailed finery and decoration is a sign of just how early a structure it is. Excavation of the surrounds found stones with carvings of Pyu script dating to the 6th century AD. It is said to be one of the oldest Buddhist monuments in Myanmar and on a full moon festival, many locals come to pray at the stupa which is decorated with flower and fruit offerings while music is played on loudspeakers and free food is offered to all. Next on the route, the Cemetery of Queen Beikthano has six large stone burial urns partially set in the ground. Local lore has it that the mighty Pyu queen and her relatives were buried there. 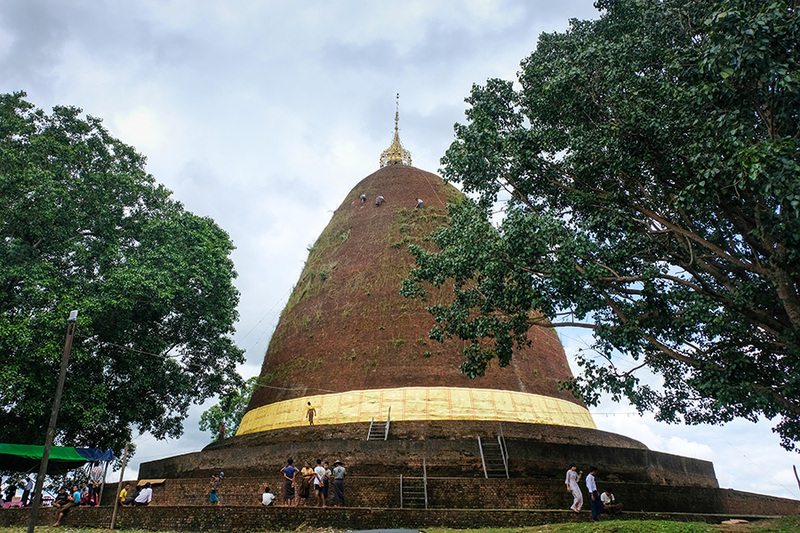 Payama is another massive stupa, this time egg-shaped and measuring 42 meters in height. It is hollow and is said to enshrine relics of the Buddha. On the full moon of Thadingyut (usually in October) a small festival takes place in the compound and men use ropes to make the perilous climb up the curved stupa walls to clear the grass and growth that has grown in the brickwork during the year. Payagyi is a third stupa located on the outskirts of Pyay. Though it lacks the glory granted to the other stupas which stand out tall on the flat, green farmland, there is a buzz around it and what’s more, local lore has it that the big toenail of Buddha’s right foot is enshrined inside. Pyay is off the usual tourist trail and so offers genuine local experiences and welcomes. Two days is enough to see all Pyay has to offer. 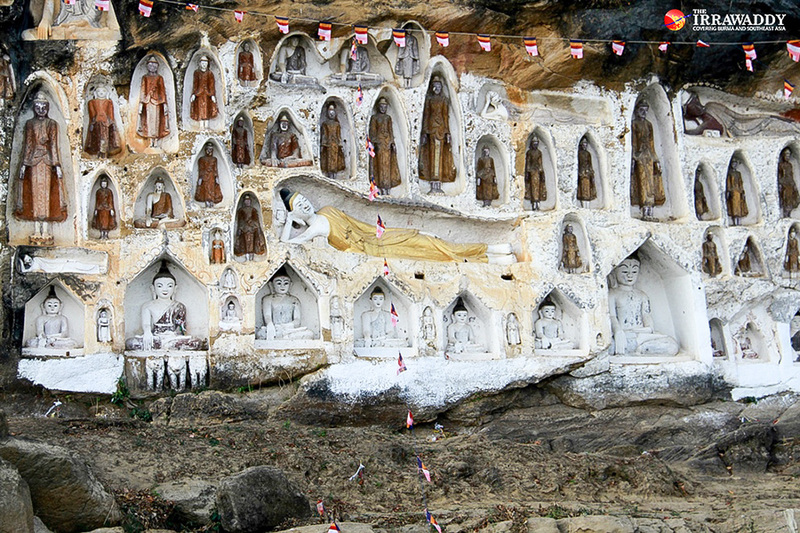 As well as Sri Ksetra, visitors should take a day to visit Akauk Taung located two hours from Pyay city. Along the cliff following the river, dozens of Buddha images are carved into the rock face. Shwesandaw Pagoda is the main pagoda in the city center and is also worth a visit around sunset. Thone Pan Hla is a beautiful abandoned monastery located 30 minutes from the city or 10 minutes from Queen Beikthano Cemetery which has become a popular spot for photographers and models for the lost-kingdom atmosphere it evokes. For dining in Pyay, Wish restaurant on Strand Road which sits on the banks of the Irrawaddy River, is very popular and has great views and good food. A lively night market kicks off at dusk on Old Post Office Road and offers lots of sweet and savory dinner options. At one end of the night market is Baydaryi Food Village which is a modern restaurant with a fun, upscale street-food theme and street-side seating which is ideal for people-watching over a beer in the evening. Some accommodation options include Lucky Dragon Hotel ($40) which is centrally located and has a small outdoor pool, and the new Hotel Ksetra ($25) located away from the city but closer to Sri Ksetra. Transport options to Pyay include buses from Yangon which take around seven hours and leave regularly throughout the day. Pyay’s bus station is a 10-minute tuk-tuk ride from the city center. Trains from Yangon Central Railway Station leave at 1 p.m. and arrive in Pyay at around 9:30 p.m. The journey by private care takes six hours or less.